Shropham Mill Farm smockmill stood on the north side of the Hargham Road to the southeast of the village. The mill used patent sails to power two pairs of French burr stones, one pair being 4 ft. 6 ins. 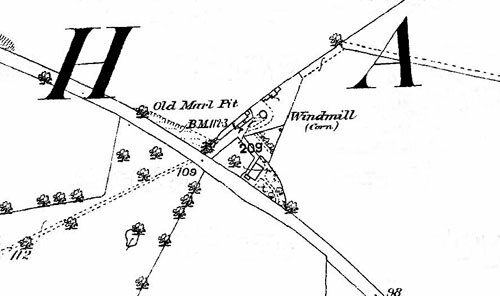 and the other pair 4 ft.
George Burlingham and his wife Margaret had a son John, who having served his apprenticeship at Sapiston Mill in Suffolk, went on to own and run Old Buckenham towermill. No. 7 95a. 3r. 4p. 2 Steam Engines with Thrashing Drums etc. Sale of Portable Steam Engines etc. property of Mr. John Sayer and sold in consequence of his having hired a mill. 2 Steam Engines with Thrashing Drums etc. without reserve. Wanted, a Young Man as IMPROVER in a Windmill. Board & Lodging in the House. References required. Apply personally to John Sayer, Shropham, Thetford. BACON & SONS will Sell by Auction the Materials of a WINDMILL just taken down and including patent Sails, Pitch Pine Stock (new), 48 x 12½ x 12, Oak Upright Shaft, 25 ft . long, Plumbing Block, Brasses etc., Stone Nuts complete, French Burr Stoners 4 ft. 6 in. and 4 ft. (one pair new), Iron Wallower, Governors, Lighter Irons, Posts for Windshaft, Pulleys, Wheels, Straps, Chains, Blocks, about 5 Tons of Cast Iron, quantity of Iron Bars, Rods, Bolts and Nuts, Lead and Brass, Oak Baulks, Planks, Scantlings, Deal Boards, Doors and Steps, Firewood and Sundries, also Beam, Scales and Weights (20 stones) Sack Barrow, Bushel and other Measures and also 20 capital Ash TREES. Sale to commence at 11 o'c. The Sayer family also ran Shropham Mill Lane smockmill and Shropham postmill.